Browse through a large variety of South Indian Pappadam that comprises Black Pepper Pappadums, Green Chilli Pappadums, Crushed Red Chilli Pappadums, Garlic Pappadums, Cumin (Jeera) Pappadums and Indian Mixed Masala Pappadums. Processed in hygienic processing facility, these are widely reckoned for taste and quality. We invite our buyers for a desired quantity that can be made available to them at best industry prices. A great combination of chilli and garlic together, we are offering to our clients a variety of Chili Garlic Papad /Pappadums that are finely prepared to be served with day to day meal. These pappadums make a great combination with the main course meal in India and in many countries, these are also used as a side dish served with a variety of sweet n sour dips that enhance its taste even more. 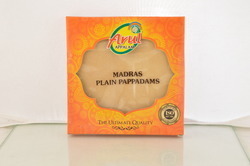 We are manufacturing the ultimate quality Madras Plain Pappadams. Our company is based in Chennai, Tamil Nadu, which is the extreme corner of South India. 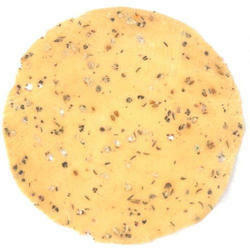 Hailing from the city, we imbibe the traditional preparation techniques and recipes for a variety of South Indian Papads /Appalam/Poppadom that are very popular for its unique flavors and rich aroma. 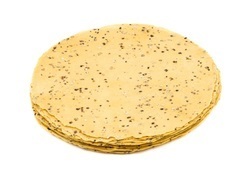 Offering innumerable variety in papad, we invite inquiries from buyers across the globe. We welcome queries for Appalams & Pappadams from Overseas Countries like Uthe United Kingdom United States, Australia, China, Denmark, France, Netherlands, New Zealand & Norway. 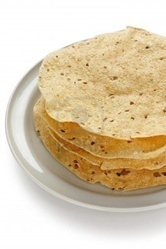 Offering sumptuous taste with quality, we are engaged in manufacturing Cumin Papad /Appalam/Poppadom that is made in our hygienic processing unit to ensure complete hygienic factor in the pappadums. Available in specific order quantity, these pappadums are prepared from freshly crushed and sorted cumin that is placed just in the right amount to ensure correct taste and flavour. 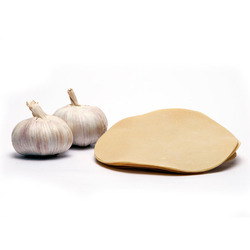 Adding that extra bit to the platter, we are engaged in manufacturing Garlic Pappadums that are sure to have that right amount of garlic that gives right and mouthwatering taste. A foodies’ first choice, this garlic pappadums are very crispy and are an ideal combination of ground urad dal flour (black gram), freshly crushed garlic, salt, bicarbonate soda and cottonseed oil.